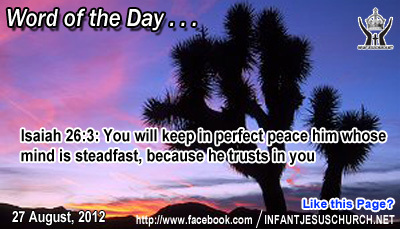 Isaiah 26:3: You will keep in perfect peace him whose mind is steadfast, because he trusts in you. Heavenly Father, Father of Peace, thank you for giving us the assurance that our life will not be lived in vain. May we share that peace with others today. In the name of Infant Jesus, my Lord, we pray. Amen. Today’s Gospel Jesus gave a sequence of examples to show how misguided they were. In their enthusiasm to win converts, they required unnecessary and oppressive rules which obscured the more significant matters of religion, such as love of God and love of fellow citizen. They were leading people to Pharisaic rather than to God. Jesus also chastised them for their evasion of binding oaths and solemn assurances. Oaths made to God were considered compulsory, but the Pharisees found clever ways to avoid the obligation of their oaths while convenience got in the way. They forgot that God hears each word we utter and he sees the meaning of the heart even before we speak or act. The scribes and Pharisees favored their idea of religion to God's idea. They failed as religious leaders to teach others the way of God's kingdom since they failed to pay attention and to understand the intention of God's word. Through their own arrogance and prejudice they blindly shut the door of their own hearts and minds to God's accepting of his kingdom.